Feel like a motocross pro on this 16 Inch Scrambler Bike! 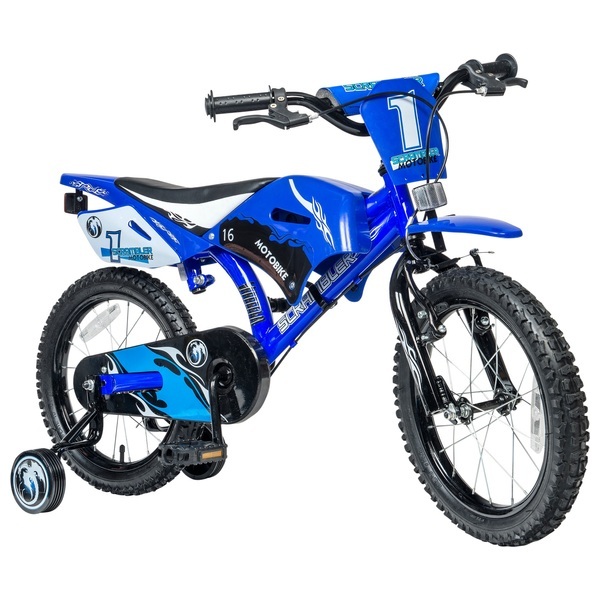 Designed to look just like a motocross bike, this pedal-powered bicycle is perfect for kids who want to stand out from the crowd. The sporty handlebar plaque features a racing number, ideal for kids who love all things fast. The 16 Inch Scrambler Bike features a fully enclosed plastic chain guard to protect your child’s fingers. 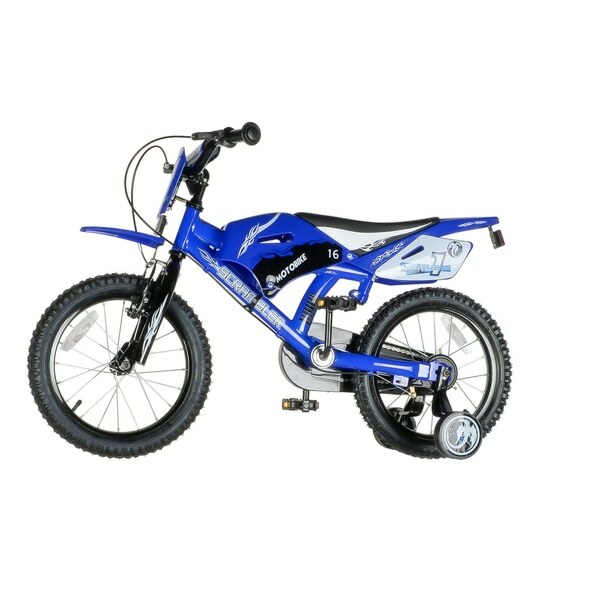 The black chain guard is printed with an epic flame and dragon design in cool blue and white, while the strong and durable blue steel frame features motocross styling that will have your little cyclist ready to race. The motocross-style fenders and black motocross saddle complete the 16 Inch Scrambler Bike’s sporty look. Removable stabilisers with spiralling white dragon graphics are included with the 16 Inch Scrambler Bike. Your child can begin cycling with stabilisers to develop their balance and coordination before moving on to cycling unaided. The stabilisers are easy to remove as your child grow into a more confident cyclist. The 16 Inch Scrambler Bike is equipped with front and rear caliper brakes for your child’s safety and the tyres are air pumped. The fixed gear makes cycling simpler for beginner cyclists. EU Warning: Not suitable for children under 5 years old. To be used under the direct supervision of an adult. Helmet and safety gear recommended.